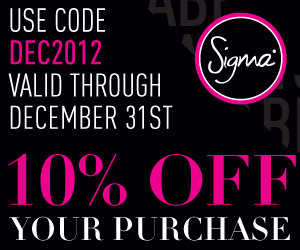 Time for another Sigma Coupon Code! For December, receive 10% off your order with coupon code DEC2012 Receive a free gift with purchase over $30- code: DEC2012 Sigma Beauty sells high end makeup brushes that I consider better then MAC or any other brush on the market. If you haven't tried it, now is the time. Makes a great Christmas gift. So what are you waiting for ? Head over to Sigma Beauty right now!